Visit our Bread Recipes page for more wonderful homemade bread recipes! Before my husband went on his mega-monster business trip, I went to the grocery store and panic purchased not just the toilet paper, paper towels and saltine crackers, but also massive cuts of meat, human-sized bags of oranges and potatoes, and food service packages of salad greens and arugula. After nearly three weeks of constant arugula consumption (not that I’m complaining) I realized I still had a large quantity of arugula that was near the end of its usefulness, and being a waste not want not sort of person, I knew there was no way it was going to be tossed. I decided to bust out the food processor and whip up a batch of arugula pesto. Arugula pesto is one of those things I love madly but often forget to make. I think of pesto as a summer dish and spend almost the entire month of August up to my armpits in basil and olive oil and whatnot and then forget all about any pesto other than the stuff I’ve crammed into my freezer. But really people. Have you been in Western New York in February? It’s usually awash in blinding white and gunmetal grey and various shades of brown. It’s not green. And when that third month of winter rolls in, I am so desperate for a glimpse of green, that I become a green food maniac: kale chips, spinach quiches, spanakopita, mustard greens, and so on and so forth. And arugula pesto is an uppercut of green. Every time I make it I think to myself, “WHY did I WAIT so LONG?” Just look at it. 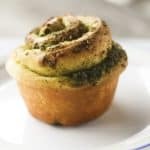 I rolled out a double batch of my best beloved bread dough and slathered it generously with my verdant arugula pesto, rolled it up jellyroll style and cut it into rounds á la sweet rolls. I filled two cake pans and a muffin tin, just to see which we liked better, let it rise and then baked them off. Oh my. You know that magical smell that bread dough has when it’s baking? Yeah. That smell! It’s just that much more drool-inducing when it’s filled with garlic and toasted walnuts and Parmesan cheese and arugula and olive oil. Oh me. When the rolls came out of the oven, we decided as a group that visually, the ones baked in the muffin tins were prettier with their tall, tight whorls, and smooth edges. Texturally, though, we liked the ones in the cake pans because it was fun to unravel them (like you would a cinnamon roll. You do eat them that way, too, right?) and nibble away. 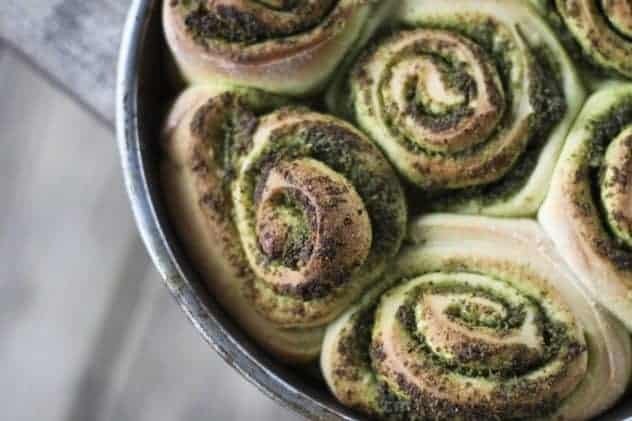 Both ways we baked them, the rolls were incredibly tender, soft, and packed with pesto flavour. The decision, therefore, is up to you. Bake them either way, just do bake them! *You will please notice I said ‘we’. That’s right. Even the gruesome-twosome anti-vegetable contingent threw back these rolls like they hadn’t eaten in a week. In other words, THEY ATE VEGETABLES WILLINGLY. Score one for Team Big People. I’m telling you, these two honyaks WILL knowingly like vegetables if it kills me. We made a dinner of these dinner rolls. I didn’t make another thing to serve alongside them because they were perfect on their own. Oh sure, they would’ve been grand alongside pasta, salad or soup, but I just wanted to taste them on their own. And hey, they’re chock full of arugula. That makes them healthy right? So how would you serve these lovelies? 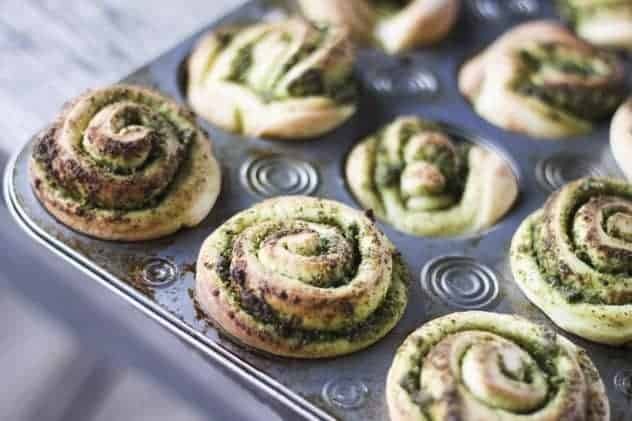 Fragrant, vibrant arugula pesto is rolled into tender, fine-crumbed, semolina dough to form these stunning and simple dinner rolls. Served alone or accompanying pasta, salad, or soup, they are a feast for the eyes as well as the body. Place a heavy-bottomed skillet or frying pan over medium heat, add the walnuts and toast them, shaking the pan frequently to prevent scorching, until the nuts are shiny and fragrant. When they reach this point, immediately turn them into the bowl of a food processor fitted with a metal blade. Add the garlic and arugula leaves, fix the lid in place and turn on the food processor. With the machine running, drizzle the olive oil into the feed tube until it reaches your desired consistency. Scrape the pesto into a bowl and stir in the grated cheese, then taste and add salt and pepper to your liking. Store tightly covered in the refrigerator for up to a week. Use non-stick cooking spray or brush olive oil into four 8-inch round cake pans or two 12-cup muffin tins. Set them aside. 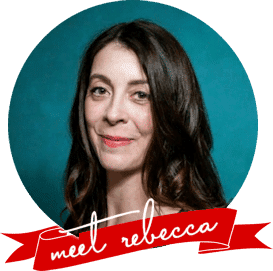 On a lightly floured surface, roll the dough into a rectangle that is about 24-inches by 18-inches.Spread the pesto over the surface of the bread dough, leaving about an inch of one long edge clean. Bake the rolls for 18-24 minutes, or until completely set and rich golden brown. Allow the rolls to cool in the pans for 5 minutes before turning them out onto a rack. 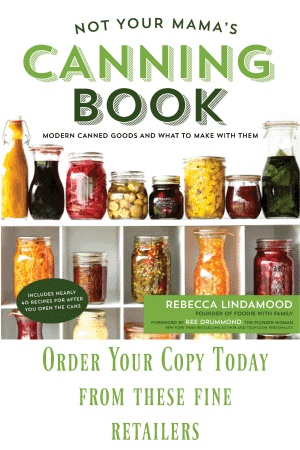 They can be eaten warm or cooled and stored at room temperature for 3 days in a tightly covered container. Yes oh yes oh yes! Pesto is my LIFE. Mine, too, Bev! I ate so many of these I didn’t even realize I had flecks of arugula in my teeth when I went out that evening to run errands and take my kids to their Wednesday night group. Whoopsie! 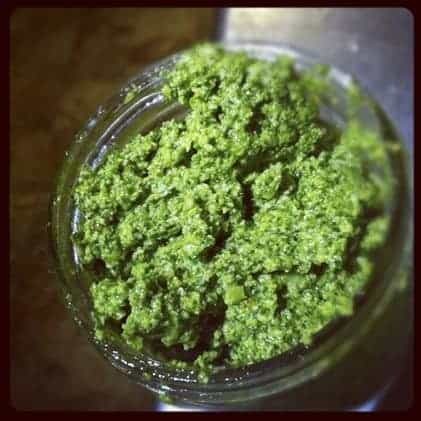 Arugula pesto? Why I never… but I WILL SOON! And I totally agree on the price of pine nuts. I generally use half the recommended portion of pine nuts and fill in the remainder with blanched almonds. No one ever knows the difference! I’m going to make these for Valentine’s Day for my pesto-monster hubby! I was using all blanched almonds because I refused to pay umpteen dollars for a teensie little 2 ounce jar when I was making vats of basil pesto… Then one of my little sisters (Christina? Jessamine?) told me to use walnuts. I kind of looked at her funny and said, and I quote, “Huh?” She was insistent. I tried it and she (whichever sister it was!) was so right!!! I’ll never go back unless I find a wicked deal on pine nuts. I don’t miss them! Try using hazelnuts in your pesto. Mmmmmm, yummy! Up here in Washington State there is a hazelnut farm in Lynden, WA and they grow several varieties of hazelnuts and my favorite is a thin skinned hazelnut (don’t need to skin it: YEAH!) that is long and slender (rather than squat/round) and kind of sweet tasting. Really yummy; Name of the farm is Holmquist Hazelnut Orchards and the name of the hazelnut is Duchilly. Your pinwheels are irresistible! 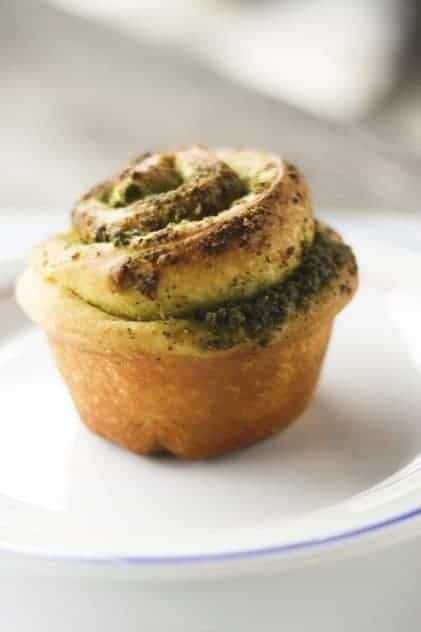 Adore the vibrant pesto with the sumptuous fresh bread, just lovely.